As far as makeup storage goes I keep most of my makeup in the drawer of my Ikea desk (click here for a picture from my instagram of my desk where I keep my makeup) and although I'd love to carry all my makeup with me wherever I go it would be slightly inconvenient/borderline impossible. However! 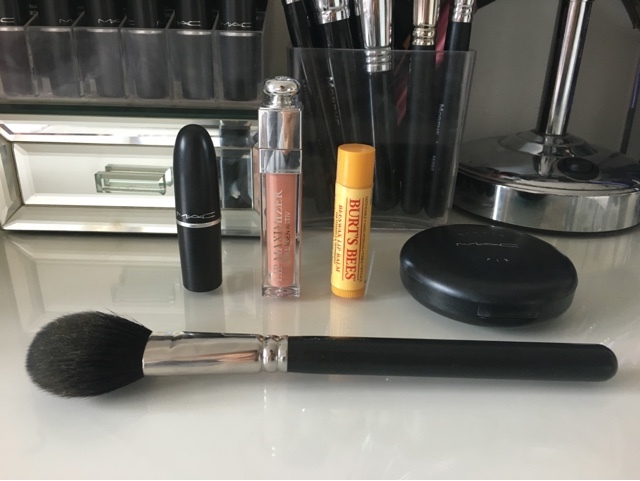 I do like to keep my essentials with me when I'm out and about so here's what I keep in my bag everyday when I'm out and about! It's very rare if I can remember to pack all my essentials in a makeup bag. I used to be good at it but as of now I pretty much just throw it all in my handbag as I'm leaving. I like to keep a powder brush and a powder in my makeup bag. Because I have combination/normal skin sometimes I do tend to get a bit of an oily T-zone throughout the day so having a powder with me is crucial to keep any shine under control! My MAC Studio Fix Powder compact also has a mirror so it's great for carrying around with me - you never know when you'll need a mirror! The weather is becoming colder now so recently I've been carrying round a lipbalm just incase my lips start to feel a bit dry throughout the day, I love Burts Bees Beeswax Lipbalm with Vitamin E and Peppermint! I love peppermint lipbalms they are so refreshing and this one doesn't apply too much product to the lip either! If I wear lipstick I always always always make sure I take my lipstick out with me otherwise I am lost! There is nothing worse than going to reapply your lipstick after eating or during the day and realising you've left it at home! I also carry my Dior Collagen Activ Lip Maximiser with me, incase I change my mind on my lipstick throughout the day and just want to go for a gloss instead! Last but not least I carry my Clarins Hand and Nail Treatment Cream with me, there is nothing worse than the feeling of dry hands! And because I'm always out doing things, pulling my makeup case, writing and sanitizing my hands before doing makeup (which can be very drying!) my hands get neglected so it's important to look after them! I love this hand cream because it soaks into my skin quickly and doesn't leave that sticky feeling which I find some hand creams do. So that wraps up what's in my everyday makeup bag, let me know what your everyday essentials are in the comments, I'd love to hear any favourites you have! See you soon! Great post! In the colder months I always need a lip balm with me! Thank you! And me too it's a saviour! I love the small range of products - such a perfect capsule range (if that makes sense haha) I really want to try the Dior lip maximiser, i've heard such good things about it! I am in love with the Dior Lip Maximiser - it's lovely product that gives my lips a little bit of a rose-tint! :) Your make up bag is so cute! Thank you so much! And it's a lovely product! It looks good when worn alone or with a lipstick which is what i love about it!